I saw the movie “42” in a private screening this past weekend. There were so many words as I watched “42”, which the year Jackie Robinson broke the color barrier in Major League Baseball. Sitting in the theater reminded me of why Jackie Robinson is one of my heroes – a list that includes Muhammad Ali, Dr. Martin Luther King Jr., and my father. All four of my heroes share a common theme: dignity. Ali was dignified while he stood steadfast against fighting in the Vietnam War, a decision which cost him his titles and three years of his boxing prime. Yet he came back and eventually regained the title of heavyweight champion of the world. We all should know what Dr. King had done and his role during the Civil Rights Movement. Otherwise, you need to complain to your school for suffering through an improper Black History curriculum. My father taught me how to be a strong black man and a productive member of society. He never let his Jim Crow-era upbringing get him down – never made excuses. Then there is Jackie Robinson. While I had an idea of the road Robinson took to break the color barrier, I never knew what he had to endure. I mean, some of his Dodgers – and minor league Montreal – teammates did not want him. His Dodger teammates resented him because either 1) they felt a black man didn’t belong and 2) they felt like a side show with the media attention. Hell even his minor league manager called him the “n-word” behind his back. Oh, and let’s not forget the scene where an opposing major league manager repeatedly called him the “n-word”, “porch monkey” and other epithets. What moved me was that Robinson did not let the racial abuse – from opposing fans, players and even some of his teammates – get him down. He never made excuses, and more importantly he kept his dignity. One of the characteristics of being a hero is paving the way for others while standing tall in the face of danger. The amount of death threats Robinson received on almost a daily basis (in his rookie year alone!) would have been enough to cause a normal man to quit. Yet Robinson carried on without breaking. 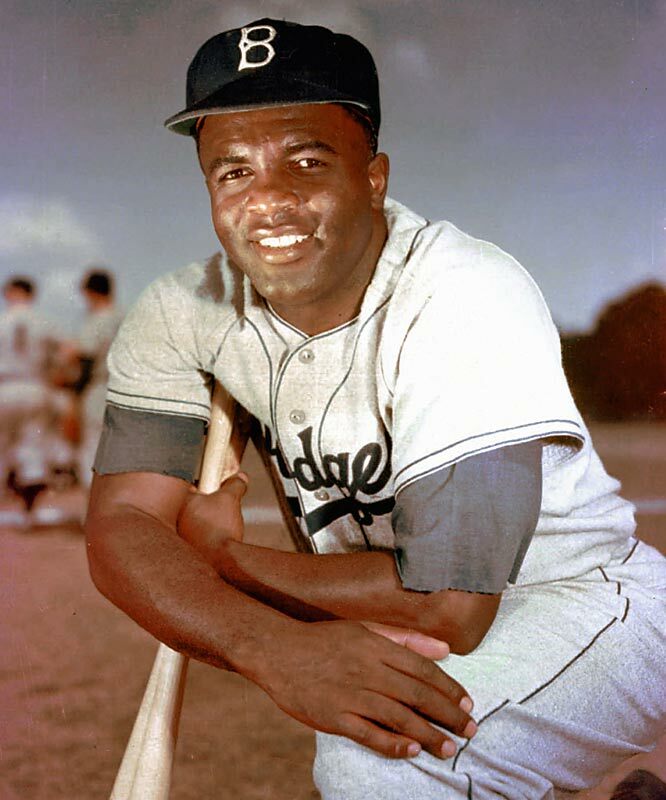 Many baseball players of color – and football, basketball, hockey and tennis players of color – have Robinson to thank for his courage. Jackie Robinson was indeed a true American hero. Hey Scott! My sis and I saw the movie as well. Although the movie “42” probably could have used better screenwriting, Jackie Robinson’s life is a testament to the struggle of African Americans, and all minorities, to be treated with human dignity. To delve deeper into Mr. Robinson’s life, read his autobiography, I Never Had It Made. I started reading it this week. Also check out Jackie Robinson: A Biography by Arnold Rampersad and Opening Day: The Story of Jackie Robinson’s First Season by Jonathan Eng. Many Jackie Robinson books are available for for young people. His daughter Sharon Robinson has written quite a few. Movies about great people always prompt me to learn more about their lives.